Millions of people use dedicated proxy sites to bypass pirate site blockades. "Unblocked" has grown to become a leader in this field, which has made the site a target in its own right. This has resulted in an ongoing game of cat-and-mouse that has led to dozens of forced domain name changes. 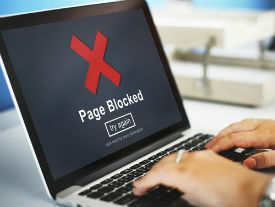 The entertainment industries generally view website blocking as one of the best tools available to prevent people from pirating. The practice has been around for over a decade and has slowly expanded to more than 30 countries around the world. Unblocked started in 2013, mainly in response to the UK blocking efforts. It began with links to a few dozen blocked pirate sites, and today that number has grown to more than a hundred. The site quickly gained popularity. While that’s usually good news, in this case it presented a problem as well, since the Unblocked site itself has now become a blocking target. It didn’t take long before it was added to various blocklists, which means that it has to regularly ‘relocate’. In recent years this has resulted in domain change after domain change. Initially, this only happened sporadically, but the Unblocked team informs TorrentFreak that it’s done roughly once a month now, usually after users report new blockades. Just a few weeks ago the site moved from unblocked.llc to unblocked.cx to evade another block, for example. However, the latter domain was swiftly suspended by the domain name registry CoCCA. Domain suspensions are not common, but they happen. In this case, the registry took action after a complaint from a copyright holder, the Unblocked team informs TorrentFreak. “We contacted the registry and they said the use of unblocked.cx was against their TOS and showed us an automated DMCA complaint they received regarding some movie links. We then changed the domain to unblocked.pet. “Unblocked.pet is the 38th domain for the site,” the Unblocked team adds. To stay true to its name, the site has to find new domain names time and again. The total count of 38 domain names thus far says enough. While this is a nuisance for the operator, it doesn’t appear to hurt the userbase too much. “We haven’t noticed any major shifts in traffic caused by the blocks. As long as we have a new domain up and running, people are able to find it immediately through different means,” the Unblocked team notes. After losing the .cx domain it took four to five days for the traffic levels to recover. That was also the case a few years earlier when the CoCCA registry suspended Unblocked’s .pe domain name. It appears that Unblocked users have become accustomed to regular changes. They can usually find the new domain through the official Twitter account, or by going to the GitHub mirror, which has been operational since 2015. In any case, Unblocked is determined to keep going, and the site will probably burn through a few more domains before the end of the year.